No, I’m really not planning to take up basket weaving but I couldn’t pass on the opportunity to buy Canework by Charles Compton, de-accessioned from the Handweaving and Spinning Guild of Victoria’s library and on sale at their textile bazaar, held this morning. 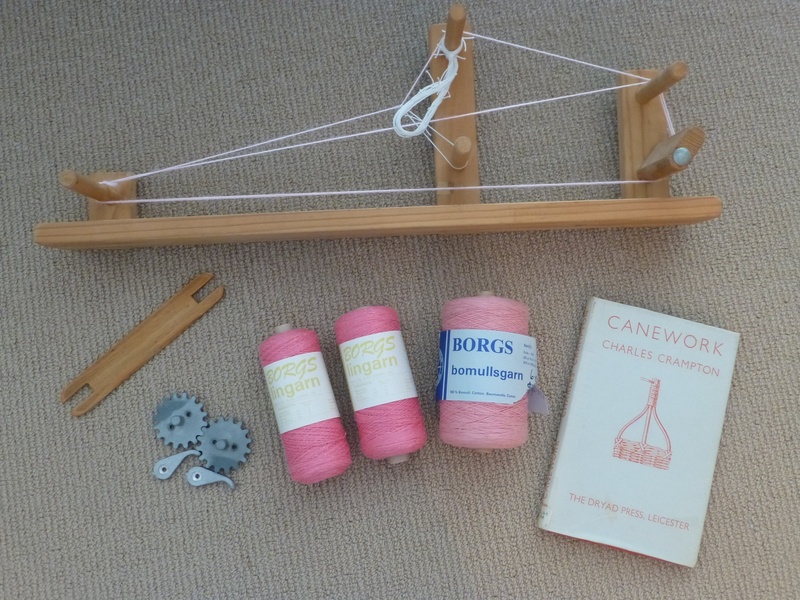 The photo shows my purchases from that sale – an inkle loom and shuttle, one roll of cotton yarn and two of linen (both from Sweden) and some ratchet wheels for that day we decide to build our own loom. I got to chat with some guild members I hadn’t met before and even swapped knot techniques with one of the senior members, who was pointed out to me as the inkle loom expert. This delightful lady was of retirement age and willing to share and enthusiastic about learning. Once she explained to me that the inkle loom warp is a continuous circle and that I need to thread alternate warp ends through the heddles, it all fell into place. I did take the opportunity to borrow a book called Inkle Loom Weaving by Frances B. Smith from the guild library as a reference though. The guild charges members 50 cents per book borrowed which is something I’ve never come across before. Perhaps the charge is to fund the library’s accession program. I’d love to know. The knot technique I taught the lady was an English knot or fisherman’s knot, one I’ve had to do a few times lately after messing up my most recent warp so badly that all I could do was cut it, sort it out and retie it over the warp rod. That will be a blog post for another day, but the lesson learned is that two crosses are NOT better than one. 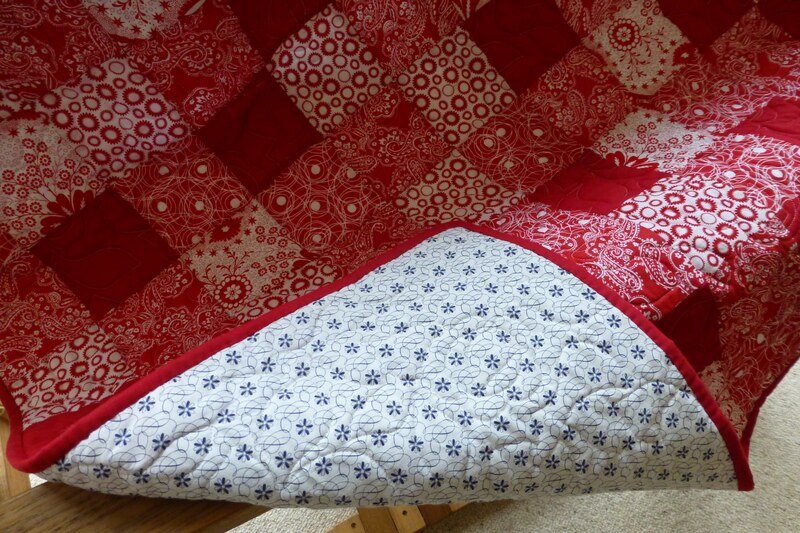 Meanwhile I’m stash busting with a log cabin quilt. I’m calling it a warm hearted log cabin because it has larger central squares than my previous log cabin. This setting is called barn raising. I decided on a log cabin because I wanted something to do where the piecing would just flow without too much thinking or fiddling about. Work is busy at the moment and I just wanted to be able to cut and sew without running back and forth to the ironing board or fiddling with triangles. 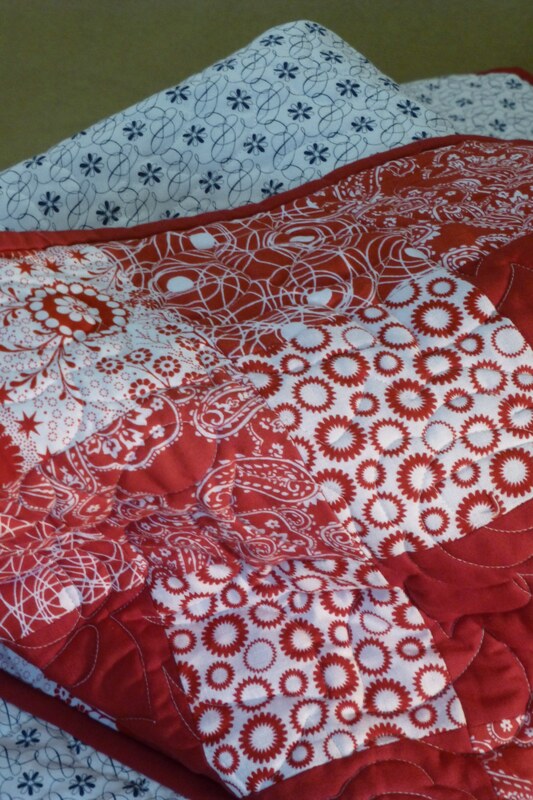 I went to Generations Quilt Patterns to look at what they had to say about layouts. They had advice on how to make sure no two log cabin blocks abut each other with the same fabric. I din’t want to be that particular. It seems to go against the spirit of a scrap quilt. I just tried to make sure I mixed things up a bit as I went. With the current state of unfinished objects/projects in train around here, it probably makes sense to start for me to start working on Christmas projects in April. But actually this block has more to do with post holiday sales than it does with pre-planning. We weren’t really happy with the selection of Christmas decorations we had for our celebration last year and I resolved to make some Christmas bunting. I took advantage of a January sale at Spotlight and picked up some seasonal fat quarters for $1 each. 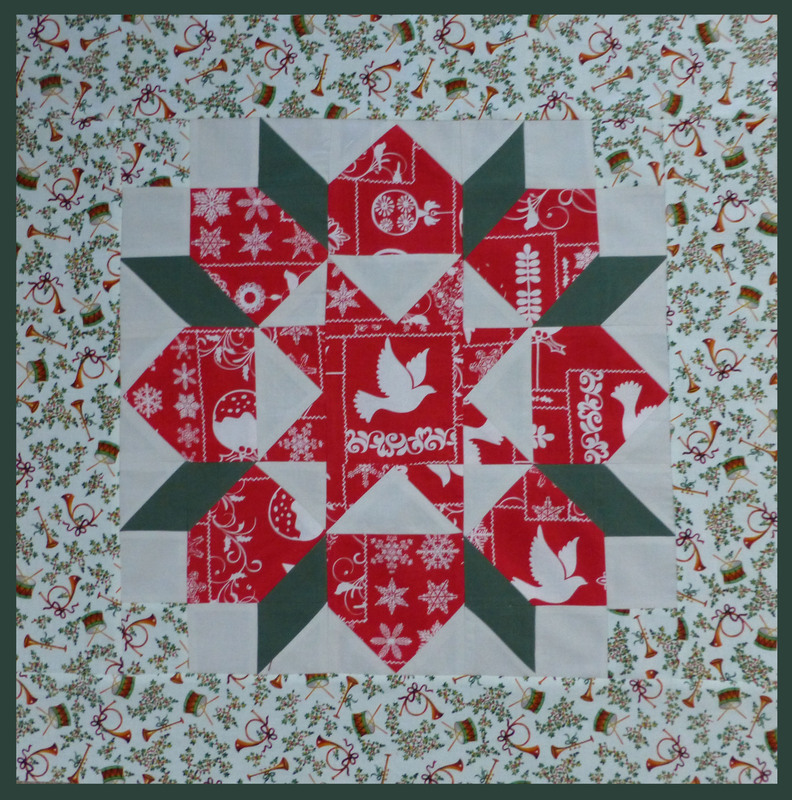 Then I came across this description of how to make a double nickel swoon block and decided to try it out with the Christmas fabrics I had lying around. And so another project begins. The border is a bit of photo editing wizardry but it does illustrate the border treatment I plan to use after I get the quilting done. Then I will add a hanging sleeve to make a Christmas wallhanging that I expect to finish at about 23 inches square. 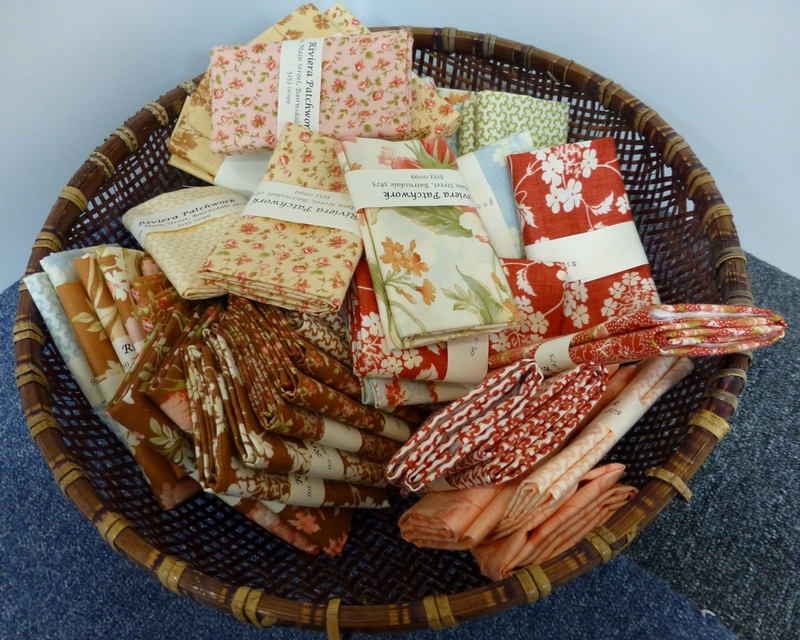 Spotlight have had 30% off all fabrics over the few days between Christmas and New Year. Of course I had to go check it out and of course I found some fabric I had to have, though dressmaking fabric, rather than quilting fabric. I’m quite looking forward to getting stuck into some garment sewing but needed to get the charm top out of the way to clear the workspace. Today I managed to both name our new canoe in a moving ceremony at Lilydale Lake (well, in a ceremony anyway) and finish my MYO charm top. Along the way I learned a new trick that reduces the likelihood of messing up a planned row between the table and the sewing machine, something that has been an ongoing challenge for me. Basically, you put one safety pin in the block to the far left, two in the block to the far right, and then you work inwards until it’s time to join the two components of the row. You can string piece right up to the last join and it’s been working well for me. I can’t imagine that others haven’t also used this approach but this time I came up with it myself rather than reading it on someone else’s blog. I made a video to show you the technique but it seems WordPress want me to pay for an upgrade before I can show it to you directly, so that will have to wait for now. 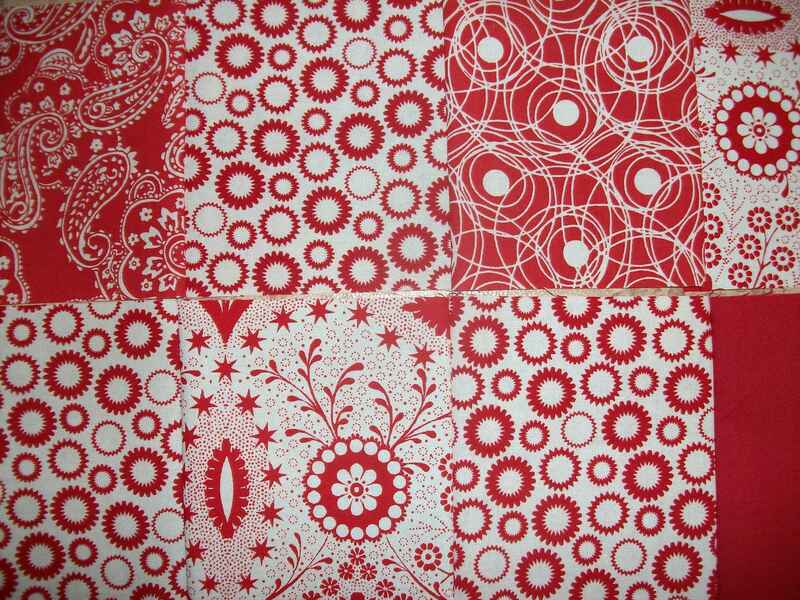 I found the backing fabric for the charm top at Spotlight, too and have decided to take this one to the professional quilter after all, to get it off my ‘to do’ list and onto hers. 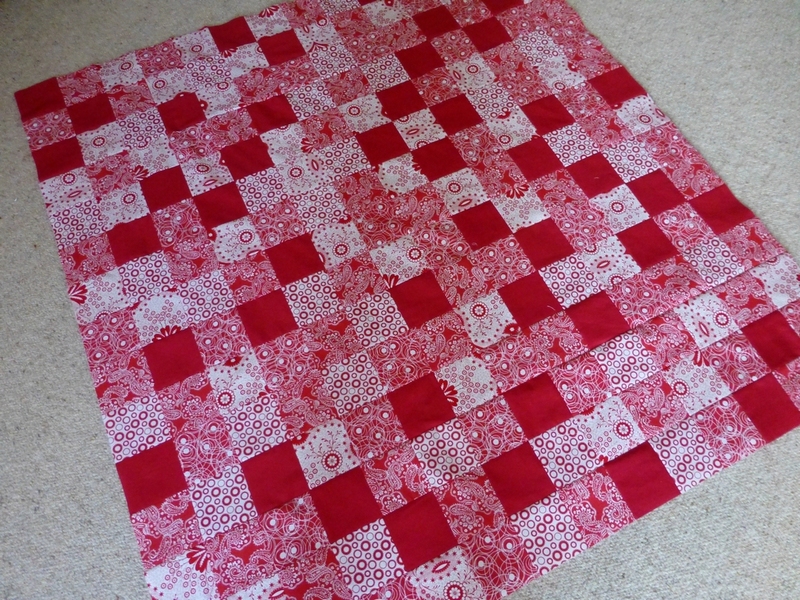 I’ve been inspired lately by a couple of our fellow bloggers who have made lovely quilts out of charm squares. I’d link to their posts but, sadly, I can’t remember where they were. Sewing squares together is not usually my thing, but I liked the look of what I saw and I’m trying to get more into doing my own (simple, straight line) quilting so I thought I’d make my own lap sized quilt out of squares. Being a rugged individualist (or perhaps just to save money) I decided to make my own charm squares. I cut them at four inches square to accommodate the maximum quilting width recommended for the Hobbs Heirloom batting I plan to use. To explain that, my plan is to quilt it using the seams as a guide, quilting about 1cm away from each seam. (Staying in the ditch is too difficult, I’ve found.) I also liked the idea of working with a slightly smaller square than the standard five inch commercial offering, for aesthetic reasons. 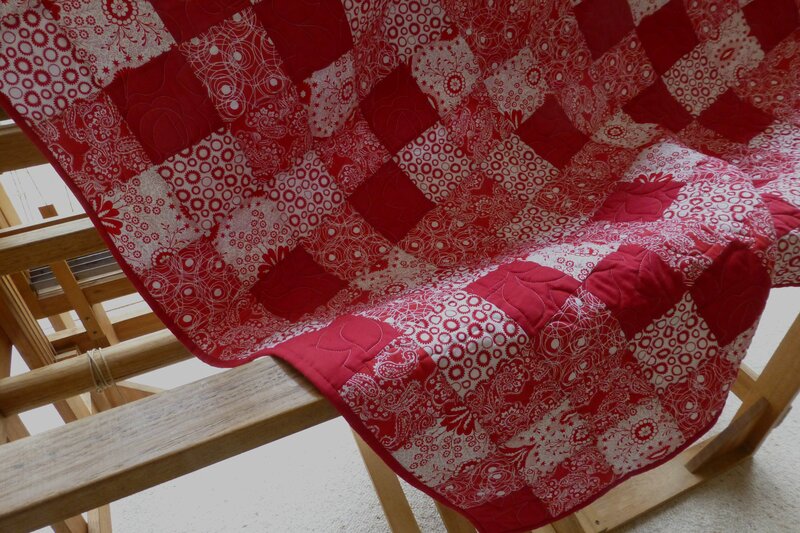 Crazy Mom Quilts says that a nice lap size quilt is 60″ x 72″. For those of you who think metric, that’s roughly 150cm by 180cm. My quilt will be smaller because I ran out of fabric but I’m including the link because I found it to be a useful reference. Three of the fabric designs are somehow related to the wonderful Victoria & Albert Museum and bear their copyright and I’m curious about the link to what might just be my favourite museum in the whole, wide world. One fabric was already in my stash and I used a Prisma plain homespun to break up the patterns with a solid. I’ll use the Prisma for the binding, too. This is how it’s looking so far. Again, I am drawing inspiration from one of my fellow quilting bloggers who asked “Why work on one project, when you can work on several.” Just don’t ask me how the binding is coming along on the bento box quilt. We had a four day weekend for the Melbourne Cup, an official public holiday in Melbourne. 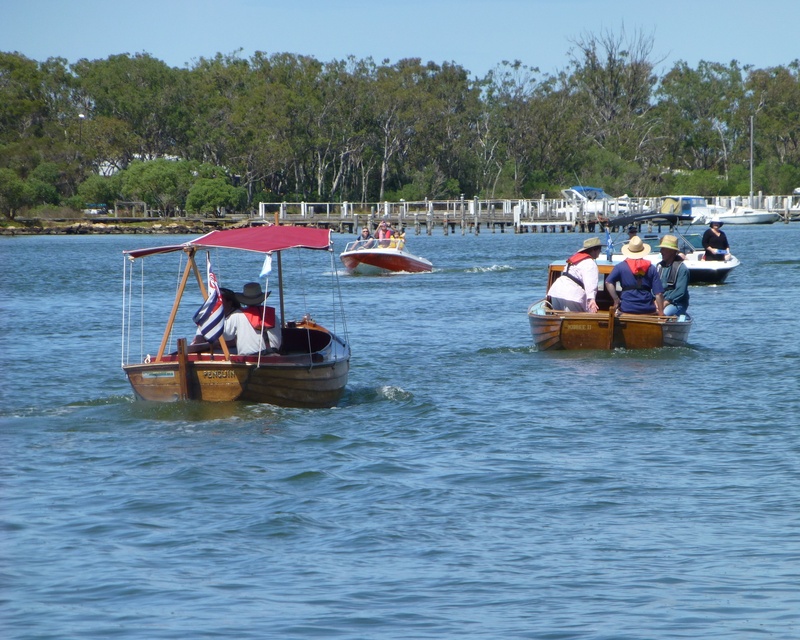 We went to Paynesville with the Wooden Boat Association so I didn’t sew a stitch. 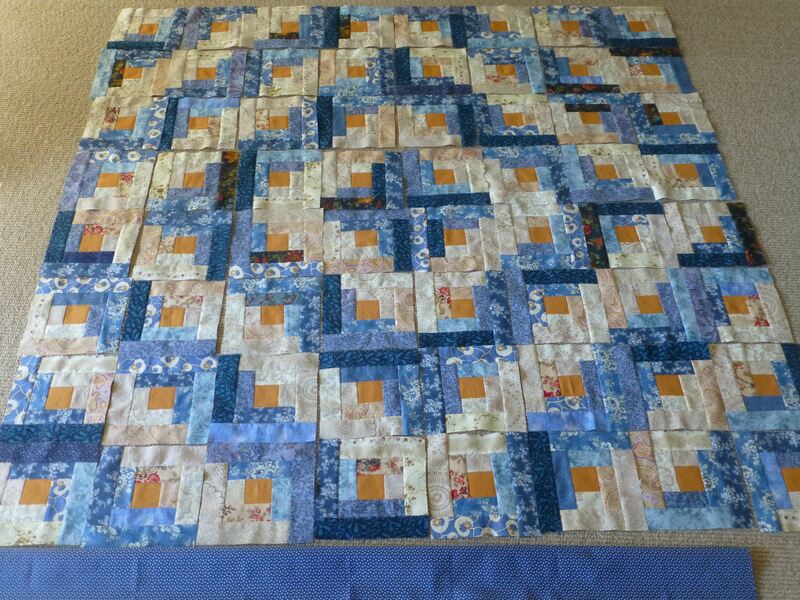 I did manage to pin the starry night quilt sandwich together, but that’s it. I did visit a quilt store in the country town of Bairnsdale though and would recommend you visit Riviera Patchwork if you find yourself in that part of the world. It’s a lovely light-filled shop, with a wide range of fabrics and the lady there was super friendly, even though I was wearing my less than flattering camping clothes. Much to my beloved’s shame and embarrassment my preferred camping attire is a pair of urban cammo cargo pants. They have a wide seat, which is handy for crawling in and out of the tent and the pattern is so wild that spills and dirt just look like part of the design- I hope. I want you to know that I shower daily when I go camping, just as I do at home, but keeping your clothes clean is a challenge when you have to crawl to get in and out of your tent. We visited Riviera Patchwork on the trip home, so I was still in my camping gear but the lady at the cash register spoke to me anyway and even took down the address of this blog, the first time a shop proprietor has ever done so. 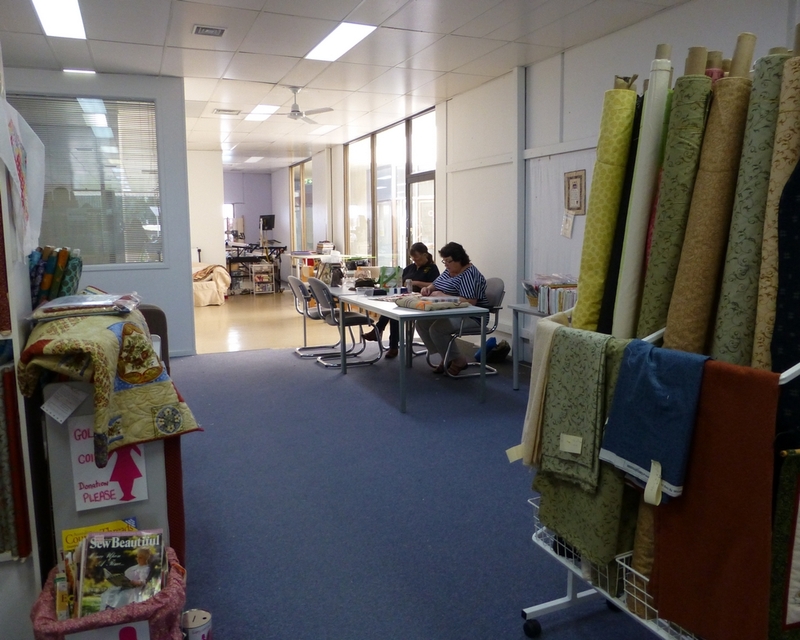 She explained to me that the regular sit and sew was cancelled due to the Melbourne Cup so two of the participants decided to come in a day early. You can see them in the photo. The other really cool thing is also visible in the photo. See the basket of magazines in the bottom left of the photo with the pink silhouette behind it? People bring their unwanted quilting and gardening magazines to the shop and put them in a basket for others to take in exchange for a gold coin ($1 or $2) donation to the Cancer Council. Brilliant. Everybody wins. My seven year old niece will be receiving a bento box quilt as a gift for Christmas. I hope she likes it. 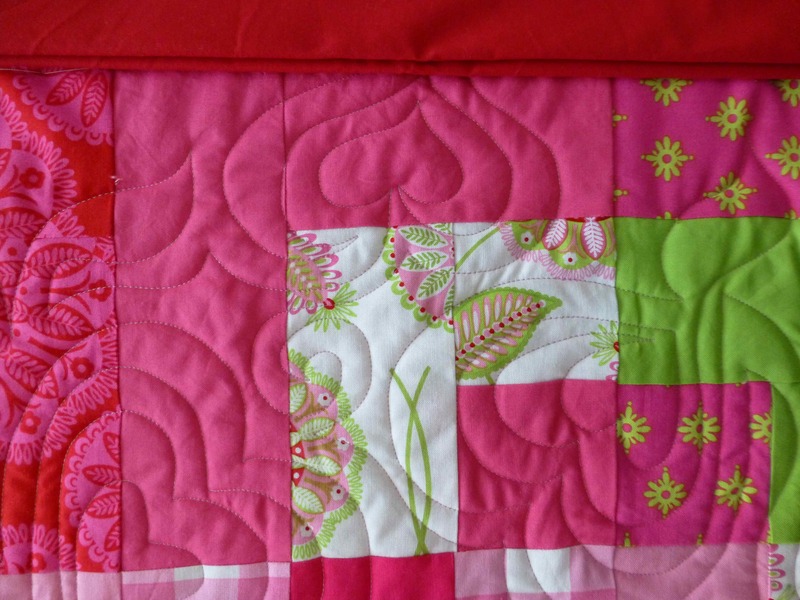 I chose a girly heart motif for the quilting, which was done by Pam Hammer. 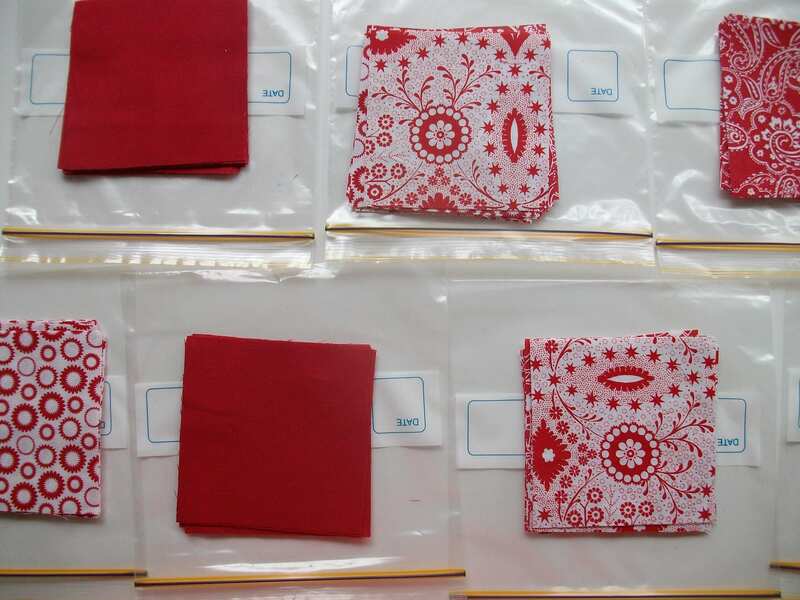 The red binding fabric is a Kona cotton, a new fabric that’s new to me but which I’ve seen used by a number of modern quilters. It came from GJs Discount Fabrics in Brunswick East, courtesy of a $10 gift voucher that came along with my enrolment in the AQS Symposium. At $14 a metre, the Kona is roughly twice the price of the Prisma plains that Spotlight stock, with no discernible quality difference. GJ’s has a wall of Kona fabrics in a huge range of tones and it’s possible that Kona offers a wider selection of colours than Prisma do. GJ’s Discount Fabrics is easily reached on either the Number 1 or the Number 8 tram, probably my favourite Melbourne tram routes because they both pass through some lovely parts of town. 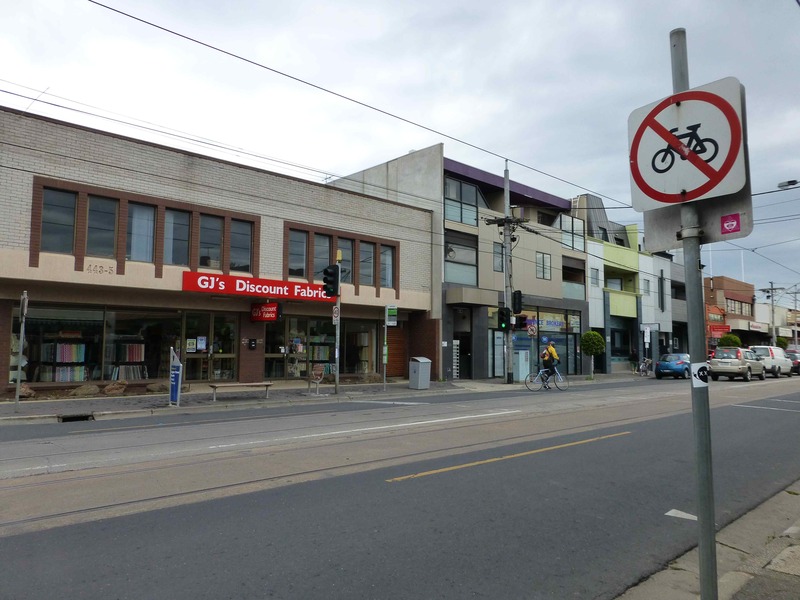 Both trams conveniently take you to stop 126, right outside the door on Lygon St.
Brunswick East isn’t a part of town I would describe as lovely, but rather as gritty. It’s semi-industrial but appears to be in the process of gentrification as I passed two massive building projects on my walk down Lygon St. GJ’s is worth a visit as they have a huge range of 100% cotton fabric for patchwork. I saw some dance and specialty fabrics but not a whole lot of dress fabrics. The ‘discount’ in their name seems to be more a marketing claim than a reality, at least when I visited. Their $2 fat quarters are a good buy but I didn’t spot any other bargains. The staff were very friendly and while I was there one of them was on the phone to one of her suppliers, trying to track down a particular fabric for a customer.